July 20, 2016 By Allyson 12 Comments This post may contain affiliate links. Read my disclosure policy. A couple weeks ago we were hosting some friends for Sunday night dinner, and I was SO excited to try a new recipe I recently thought about. I love trying new recipes when I have friends over, because they are generally pretty quick to give me their opinions. 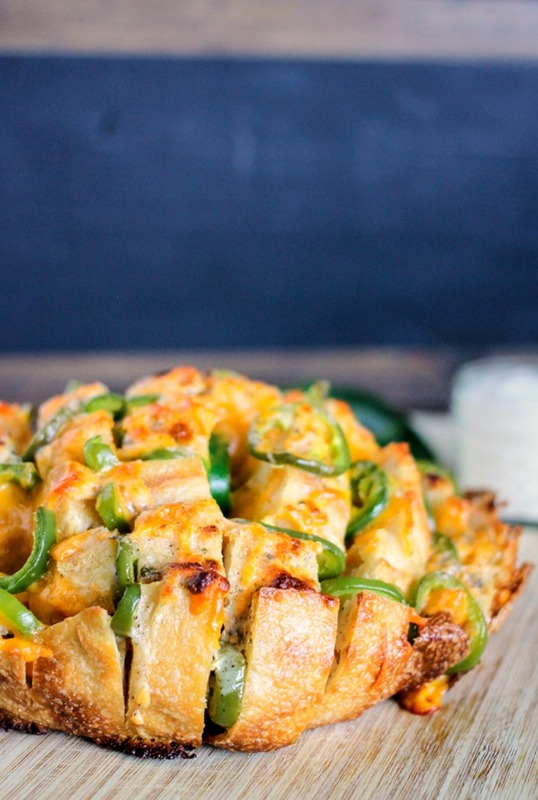 When I cooked up this Jalapeno Ranch Pull Apart Bread, I knew they were going to love it, and sure enough, they did. 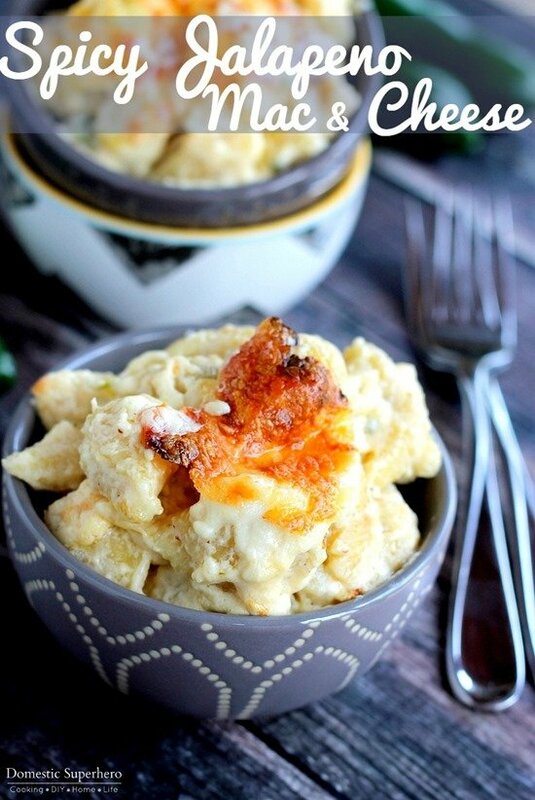 The cheese in here is delicious, rich sharp cheddar cheese, sprinkled with buttery ranch, and stuffed with delicious jalapenos. I used fresh jalapenos for this one, because I had a ton in my garden, but if you don’t have access to fresh, I think pickled would be delicious too. If you don’t like big pieces of jalapenos, dice them up – it would be perfect too, and the spice wouldn’t be too heavy. We love spice here, though, which is why I use fresh jalapenos! 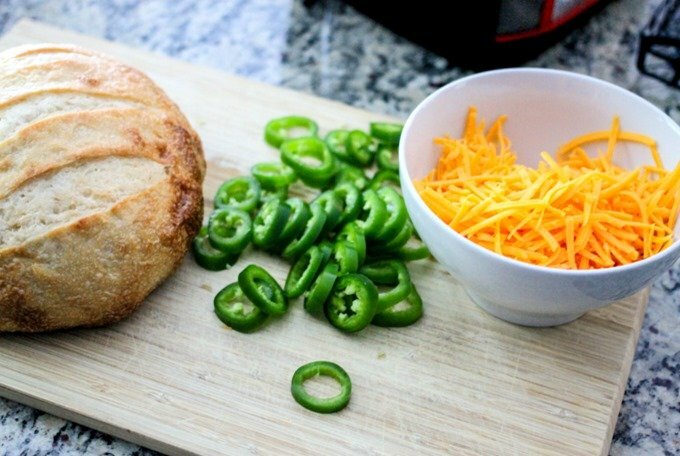 You only need a handful of ingredients for this Jalapeno Ranch Pull Apart Bread, too – bread, jalapenos, cheese, butter, and ranch seasoning…that’s it! So super simple. 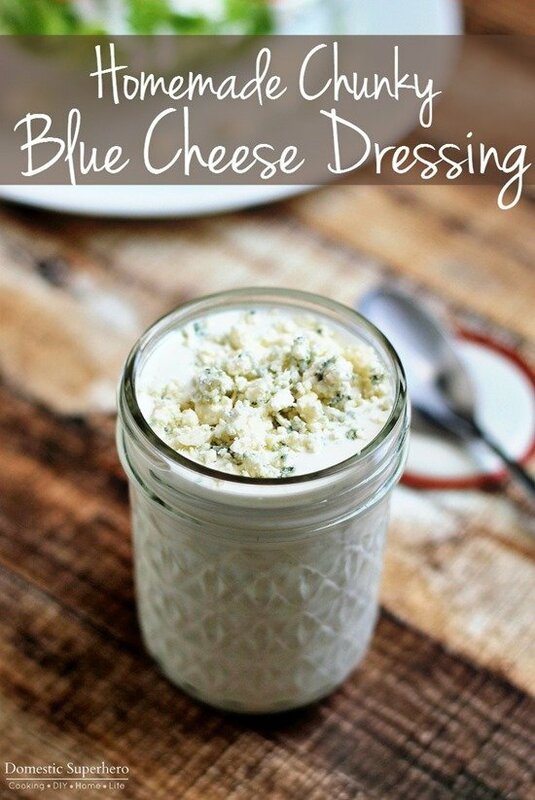 It’s the perfect party appetizer and I suggest making some regular creamy ranch or some kicked up jalapeno ranch to serve alongside it. They are SO good! 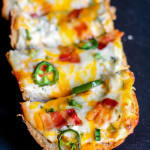 Cheese+bread+jalapenos+ranch…it’s a match made in heaven, please trust me on this one. 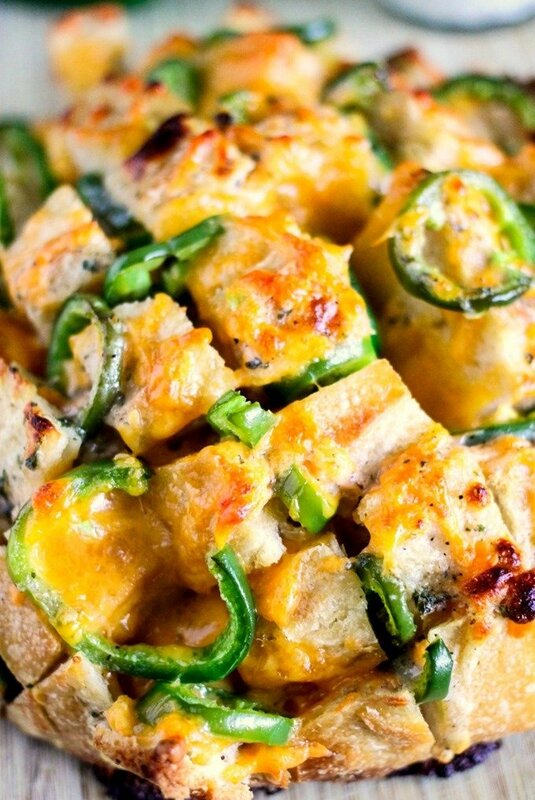 Jalapeno Ranch Pull Apart Bread to make for a potluck, party, or just to serve for your friends….heck, I’d make this on Sunday night and eat it with my husband while indulging on Game of Thrones…sounds like the perfect date night to me! Like I said, just make this, you won’t be sorry! 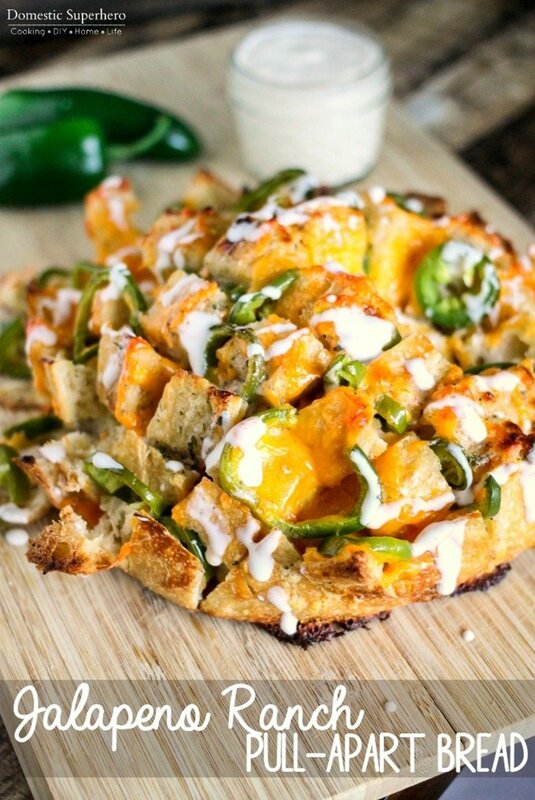 Jalapeno Ranch Pull-Apart Bread is the cheesiest, most delicious pull-apart bread with a KICK that you will ever try! Preheat oven to 375 degrees. Place parchment paper on top a flat baking sheet, and place bread bowl on the center. Cut the bread bowl in 1/2 inch slices, being careful not to slice all the way through the bread. Then cut 1/2 inch slices going the opposite direction (think checkerboard), again, being careful not to cut through the bread all the way. 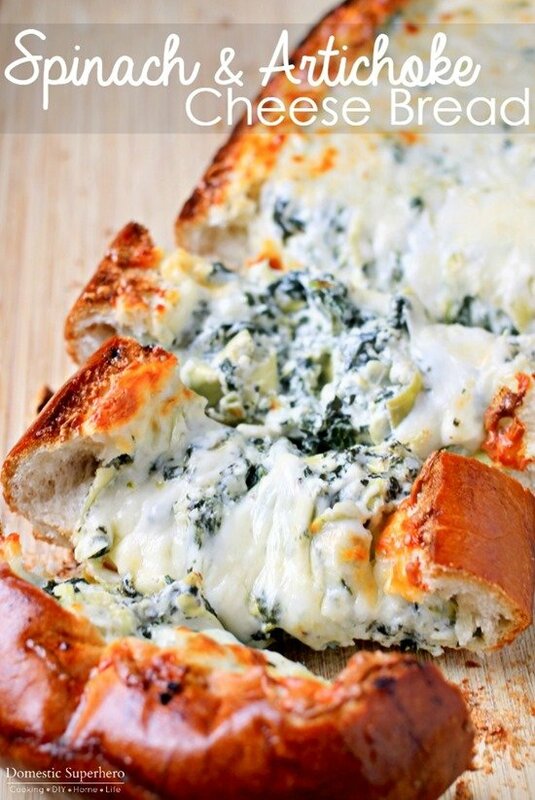 Stuff cheese into the pockets of the bread, pushing down into pockets. 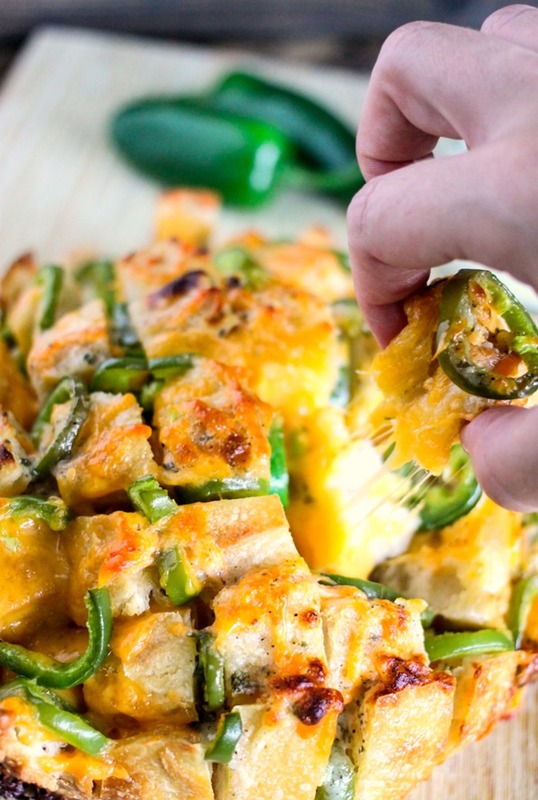 Add jalapenos and push down into pockets; try to distribute evenly. 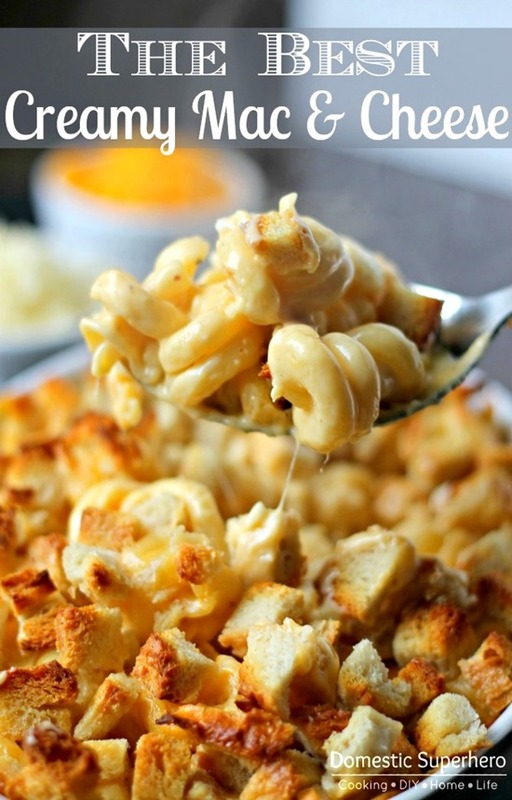 In a small bowl, mix melted butter with ranch seasoning, whisk to combine. Drizzle the mixture over the top of the bread, trying to spread it as best as possible. LOOSELY cover the bread with foil, being careful not to press the foil down (you do not want the foil touching the bread/cheese). Place into oven and bake for 15 minutes. Remove foil from the top of the bread, then place back into the oven for 5 minutes. 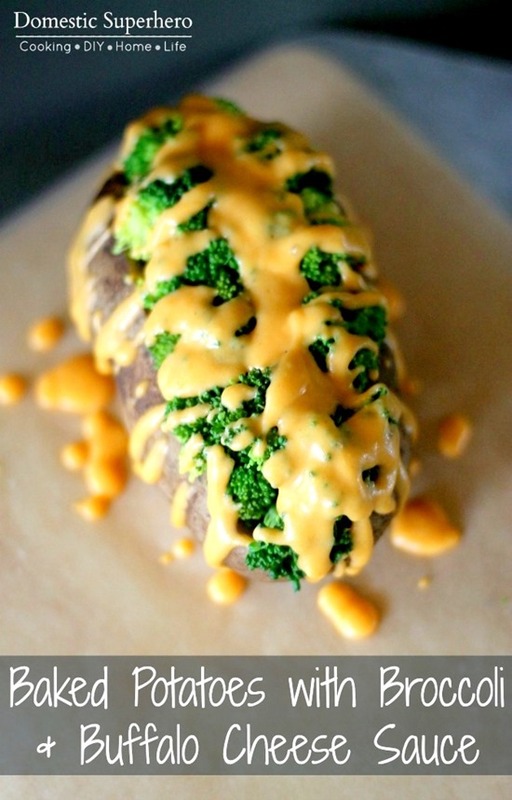 Remove from oven and serve immediately with ranch dressing for dipping.